Not content with hammering pre-sale records, Modern Warfare 2 has broken all sales records to achieve the best opening day sales for a game ever – selling 1.2 million copies in just 24 hours. 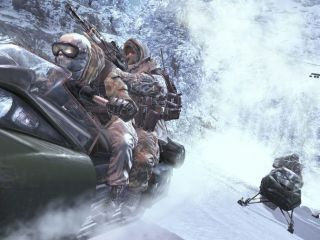 Backed by an extensive advertising campaign and the sort of word of mouth that only Apple can aspire to, Activision have produced a sure-fire hit in Modern Warfare 2, a game that is selling copies as fast as blockbuster movies sell tickets. Back in April 2008, GTA IV set a new record of one-day sales bringing in – according to MCV – 609,000 sales. Modern Warfare 2 in the same time frame sold 1.2 million. While the amount of money the launch has brought in hasn't been revealed, when GTA IV sold 926,000 units in its first five days on sale it took in around £40 million in the UK. Worldwide, this figure was more like $500 million. One of the big reasons the game has sold so well has been put down to a supermarket price war. With the likes of Sainsbury's selling the title at a cut-price £26 (RRP is £59.99) many gamers have picked up a bit of a bargain.